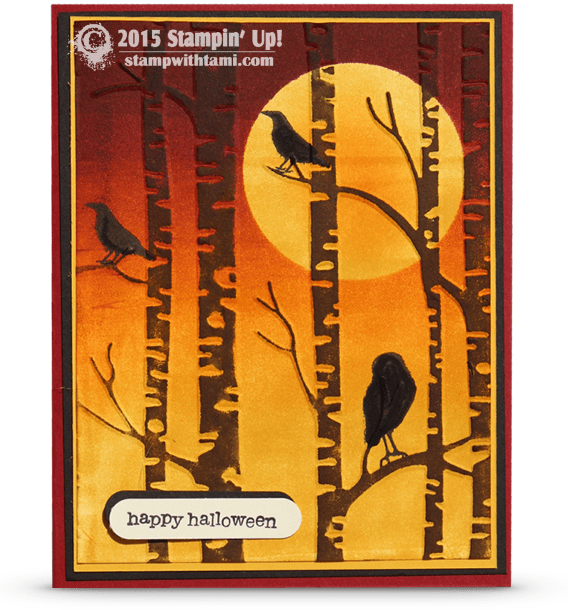 Welcome to my Stamp It Demonstrator’s Group Stampin Up Halloween / Fall themed Blog Hop. We’re all really excited to unveil our projects that we’ve been crafting for you. You may be just beginning your journey through our blogs, or you may have arrived from another blog in the hop. To continue on your journey through our projects, simply use the “previous / next” buttons on each post. My card and video tutorial share are for this Halloween “wow” card. I created this for a huge 110 person “card swap” I’m participating in while at Stampin Up’s Founders Circle event in St. George, Ut this past week. You may already be following this event with me on my Facebook Page. Stay tuned for a video recap of those card swap ideas. I was inspired by Michele Zindorf. What do you think…Is this a full moon on the rise, or a setting sun? This card is not hard to make, and when you follow these few simple tips on the video, you’ll have amazing results. I’ll share some brayer tips as well, including masking with a post it note. There is a full list of supplies on both the inspiration sheet, and the bottom of this post. Boo-tiful card Tami!…Love the technique! I love Halloween and this card is perfect. Love this card and technique! Thank you! Yeah, you go girl!!! Don’t be afraid, the worst that can happen is you flip the paper over and do the other side lol. It really is fun. Thank you so much for your video tuts; you’re so much fun. Tami – great card! I can’t believe you made 110 of them!! I think it definitely looks like the moon! Thanks for your inspiration!! I know, 110 is a lot of any card. I did have lots of help, sooooo very grateful for that. This is a great card. I’m gonna try brayering! i love to hear this inspired you to pick up the brayer. let me know if you need any help. AMAZING CARD – LOVE IT! Thank you so much for sharing and making a video of it. Can’t wait to try this new technique. Thanks so much!! My pleasure, hope you have lots of fun with it. LOVE this card! I never dreamed it was that easy to do! I bought a brayer but have been apprehensive about trying it…I think I’m finally ready to try it after seeing how easy you made it…not to mention I just have to try that card! : ) Your video instructions with tips was awesome…thanks so much! Don’t be afraid. What’s the worst that can happen? You just turn the paper over and try again on the other side if you don’t like the first one. But I think you’ll love it. Love this card because this is one of my all time favorite sets.